The Avantco MX20 20 qt. 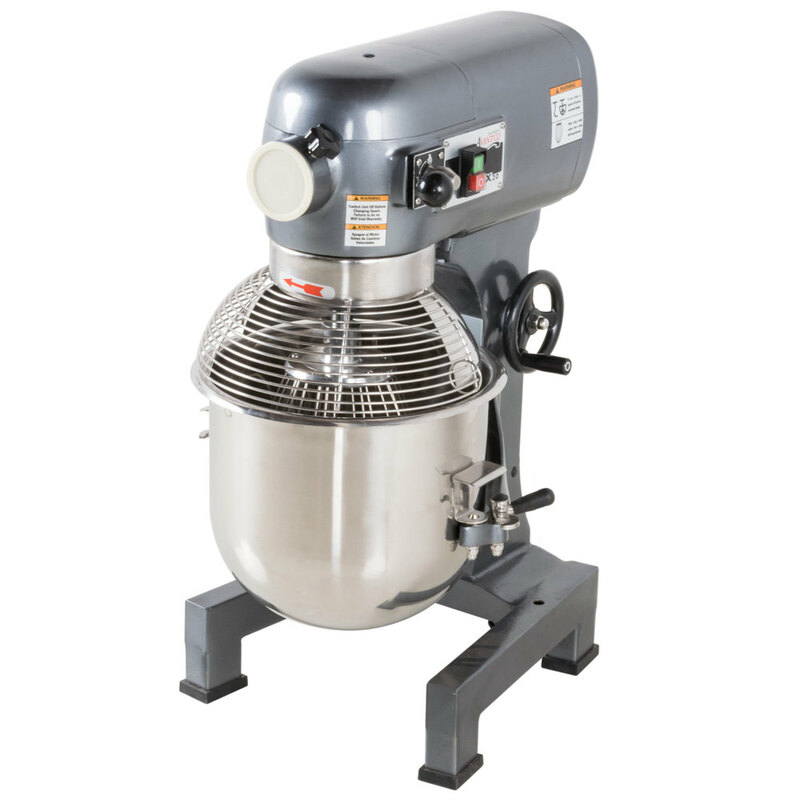 gear driven commercial planetary mixer is perfect for standard duty mixing tasks at your deli or cafe. This Avantco MX20 20 qt. 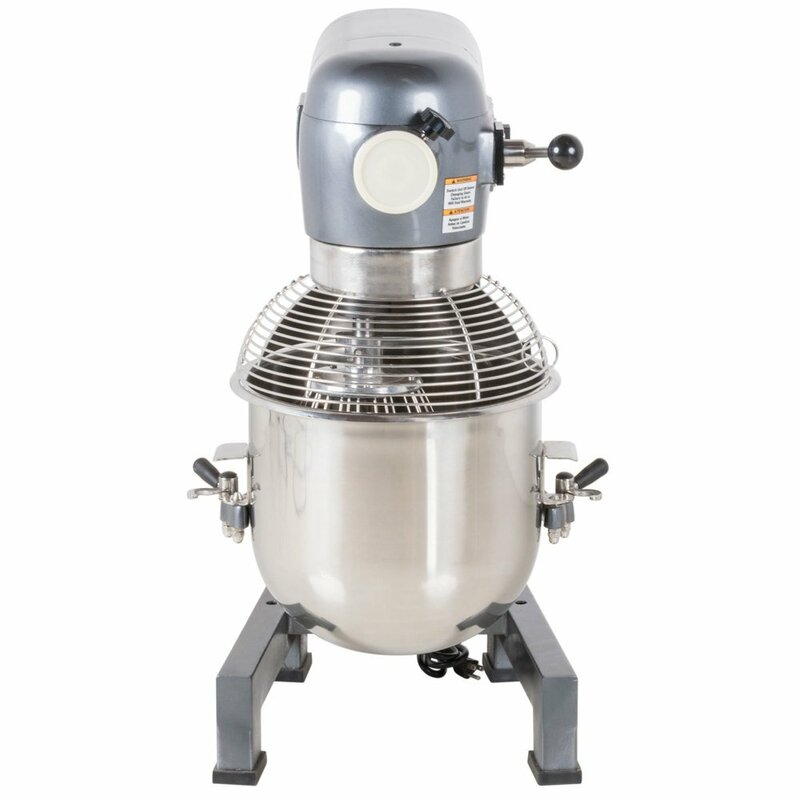 mixer features a powerful three-speed 1 hp motor with a direct-drive, gear-driven transmission to ensure consistent mixing speeds even when its bowl is full. 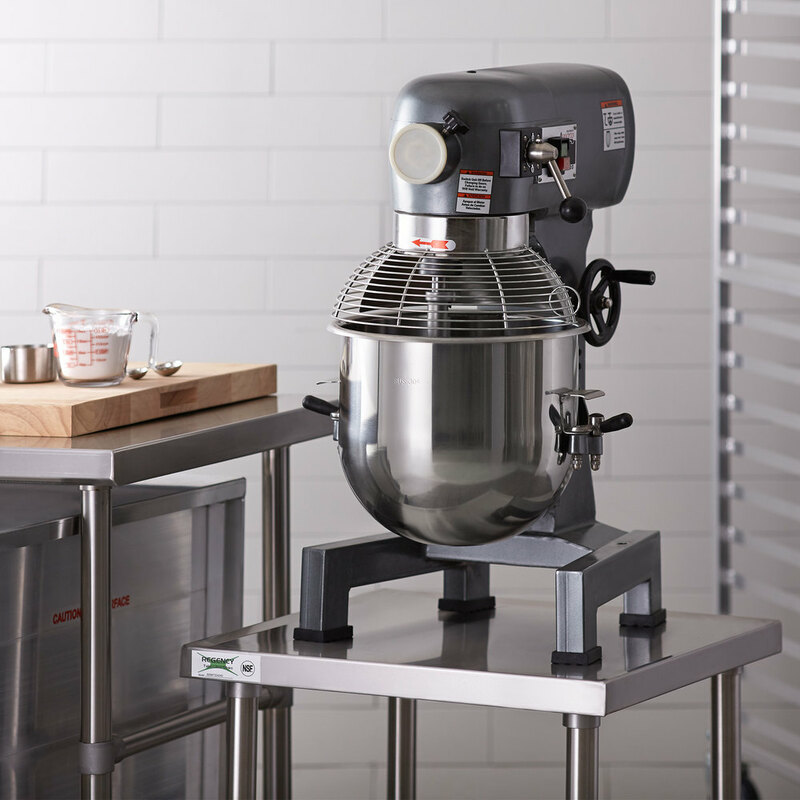 It comes fully equipped with a type 304 stainless steel mixing bowl and wire whisk that will last longer than those provided with some other models. Plus, a cast aluminum dough hook and flat beater come with this mixer, too, so you can craft and create all of your guests' favorite dishes. It also has a #12 hub intended for meat grinder attachments. This planetary mixer requires a 110V electrical connection. A good mixer for light use. We don't have heavy doughs or mixes, so works well for us. Buttercream icing and cakes--that's all we need it for and it does the job. Fits the standard size bowls and attachments I had on my last mixer. This mixer is very heavy and very large. I leave it out tucked in the corner on my counter but if you have limited counter space please know that it'll be heavy to move around to use. The rubber on the bottom of the mixer helps it stay in one place even when kneading bread using the bread hook. You can hear the motor working hard but the machine stays put. This mixer has been a great addition to my kitchen. It was delivered in a wooden box and handled very well. It is mounted up on a table and is very sturdy. It is well lubricated and has made very good dough for me. This mixer is amazing.!! Came very safe with the wooden box.. excellent materials and I can't wait to use it!!! Thank you very much for the excellent product! I love these mixers. We got two and they are super sturdy. The only issue I ha e is that the bolt on the top comes loose so we have to check to tighten it. However the attachments are also very well made! Average performer...but at this price I would say this in an awesome deal. You will have a hard time finding a bigger mixer for the money. I had this mixer from 2015 and my mixer is working extremely well, never have I had one problem. Very good purchase and shipping was fast. Will order from this site again. This is the perfect size mixer for our small business. It hold about 3.5 gallons of milk, and works strong. Easy to clean and use. We purchased this mixer over a year ago and is still in good condition and runs great, the bowl is very light and durable and the attachments are strong. The only complaint is some of the attachments don't reach the bottom of the bowl when mixing and some of the nuts come loose sometimes. 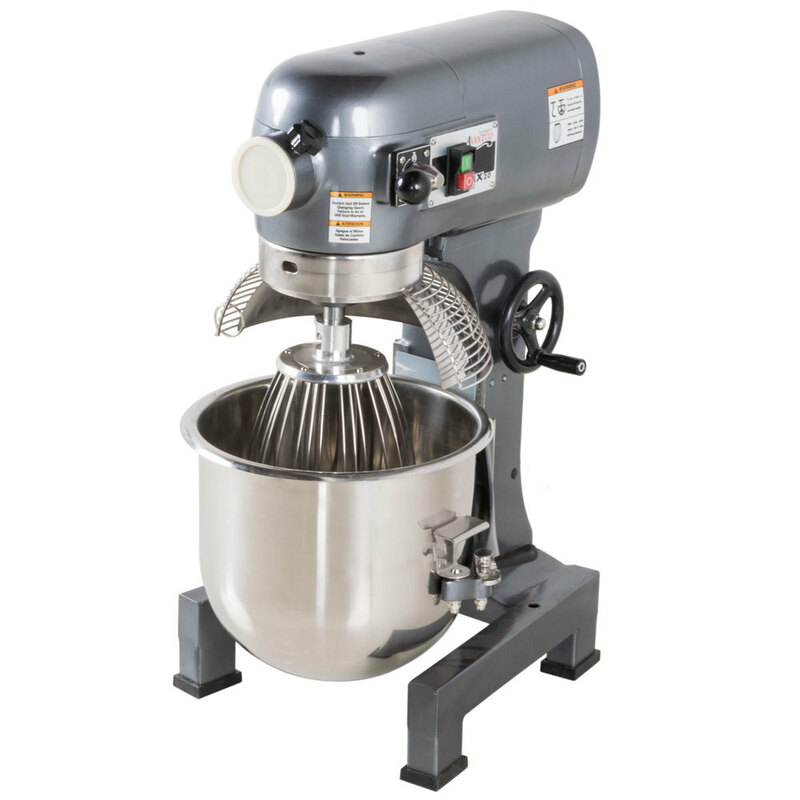 I bought this mixer to use in my small cake/dessert studio, I am able to make enough batter for three tier cake (6,8,10) at one time. Nice and sturdy and small enough to fit on a stainless steel table. This mixer is great! Comes with a huge mixing bowl that is perfect for making frosting for a bakery! Wiil definitely purchase another when the times comes. Best Price you will Find Anywhere. I have looked everywhere locally and online. It's is perfect for making icing in bulk and mixing cake mix. 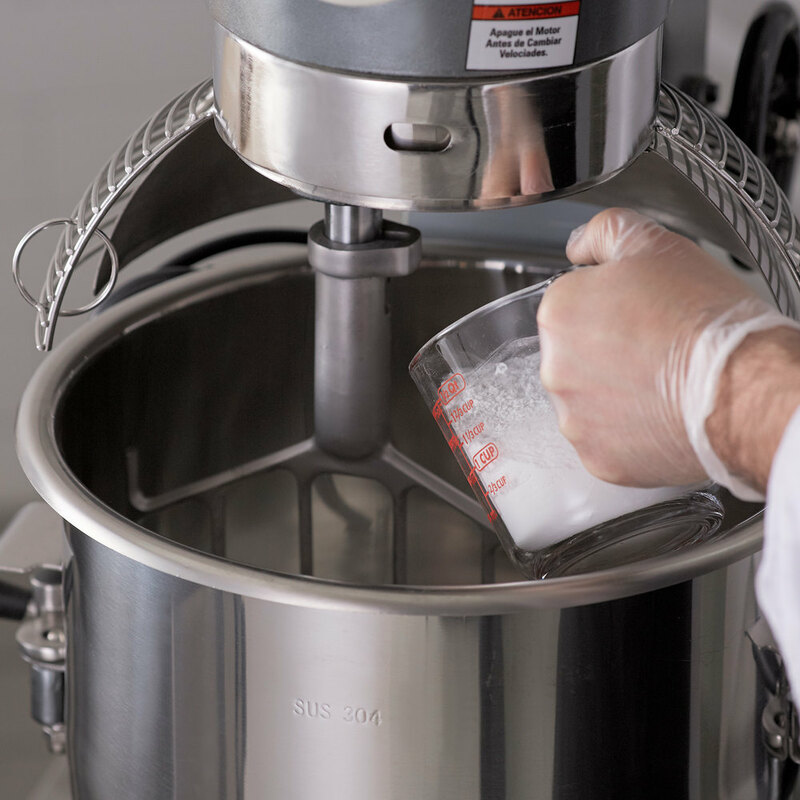 We love this mixer and it has improved the efficiency of our dough mixing operation. 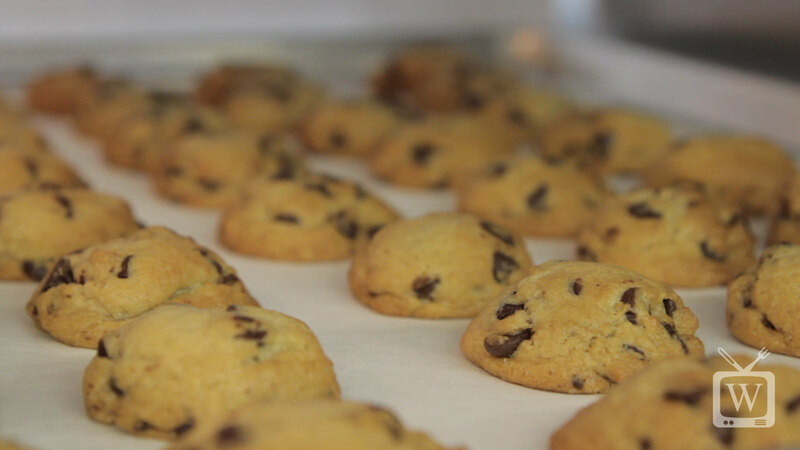 The bowl is sturdy and durable and yet light enough for all of our bakers to handle. The mixer is also quieter than we expected. Awesome mixer! Great for making our doughs and icing! Large bowl allows for making good larger batches of products. I shopped around on mixers, and I'm glad I chose webstaurantstore for my bakery needs. Great price, but was concerned about some of the reviews. Our first usage, we made 30 gallons of homemade pancake mix and it worked fine. We don't make doughs, so hopefully this mixer will last a long time. My reason for four star is we have only used it once and because of some of the negative reviews. I feel at this time this was a great choice for our application and at really GREAT PRICE! I was a little bit skeptical about ordering this mixer with the mixed reviews it had, but I'm glad we went with it anyway. It mixes well and we haven't had a problem with it. We have named our Avantco Mixers Bertha and Joyc they have been such a great addition to our bakery as we have grown. We purchased the first one about 3 years ago and then added on the second one about 2 years ago and would purchase them again. We have only had a few wear and tear issues which we have been able to purchase replacement parts directly from Webstaurant.com with great ease and they even were great to help when the second one arrived and had apparently been damaged in shipping. They were so quick to respond and send out the parts that were damaged to get it us and running super fast. Don't know what we would do without either one of them. In fact our next additional will most likely be a larger version. Without this we would have a lot work on our hands!! We use this every day for mashed potatoes, homemade biscuits & bread & margine for pies! Not sure how this guy will hold up. I do not make bread or dough with it so it should be fine as it is used in light applications. this product is time efficient and is great use for a variety of mixes any business would need for their restaurant. is has not disappointed! this mixer is sturdy and it get the job done. it mixes well but sometimes it still leaves some flour at the bottom of the batch. i just wish it had more speeds. This product is good for light use only. We normally use it to make dough for our pie crust and other various desserts. When using the mixer it has been been known to not mix the dough when using the hook. The safety feature is nice for the guard. In order for the mixer to work you have to have the guard fully close in order to start the mixer. Overall we work around the problem with the dough not being mixed up entirely. The mixer is okay for light duty. It is a little loud and runs a little fast on low speed. It is a good purchase if you are on budget, just don't expect it to be like hobart. This mixer is an excellent product to buy. At our store we use it for making pizza dough, creaming butter and sugar, making frosting and mixing our cake mixes etc. It's a worth while investment and its not as expensive as other brands. I would recommend it to anyone. We love our new mixer! Great capacity for cinnamon rolls, buns, breads & so much more, fairly small footprint for the size that it is. Very happy with our purchase so far plus free shipping! Small but great stand mixer. We use this for homemade desserts for the restaurant and big batches of mashed potatoes. Come will all attachments that you need. We are very happy with this mixer. We shopped around and found WebR to be the best price. Our pizza dough is perfect every time. Hi. Just received this mixer. Was checking it out. I am still up in the air about it, but will repost my review once I have had more time and use out of this mixer. The first thing I noticed is a "click" sound after switching between on and off. Is this normal? Has anyone else had this experience.